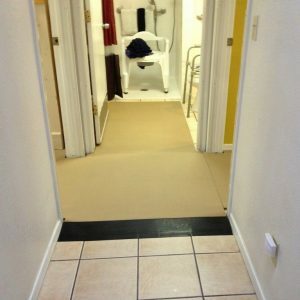 Get rid of mats as trip hazards! 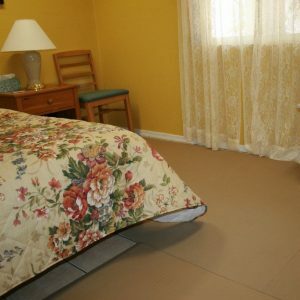 No more having to moving mats or worrying about cluttered, unsafe areas. Eliminate infection control issues associated with foam-based products. Provide protection where falls are most likely to occur, not just where we hope they will occur. Our custom fall protection flooring gives larger areas the protection and comfort of SmartCells® cushioning technology. SmartCells® Cushioned Flooring acts as an underlayment for carpet tiles and vinyl, to make your custom fall protection floor not just safe and comfortable, but as warm and elegant as you need it to be. SmartCells 3′ x 3′ x 1″ anti-fatigue custom flooring panels are loose laid (no adhesive necessary), edge adhered, then custom fit to the space. All perimeter edges are sealed, making a single monolithic, sealed pad. Easy-access transition edging is applied where needed.